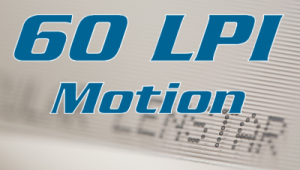 Motion 60 LPI Lenstar®Plus lenticular sheet was specifically designed for small animation pictures and large flip images, such as in-store and other point-of-purchase applications. With a lower lenticule count per inch and a 54° wide angle, this lens design provides the printer with a simple solution to deliver larger images that need to animate cleanly. This efficient print performance lens greatly reduces waste concerns for these demanding imaging requirements. The Motion 60 LPI Lenstar®Plus lenticular sheet is not produced anymore but we managed to keep some stock for our customers.